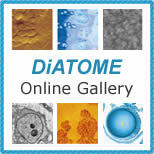 The high quality Diatome diamond knives are not just perfect for producing ultrathin and semi-thin sections, but also for surfacing sectioning of all kinds of biological and industrial specimens for AFM investigation. 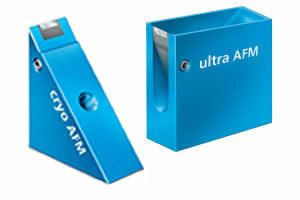 Diatome ultra AFM and cryo AFM knives are specially tested to ensure that they meet the increased quality requirements of AFM investigation. They produce extremely smooth sample surfaces and guarantee the best possible structure preservation. 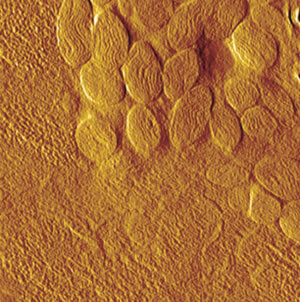 Top image: AFM amplitude image of the muscle of cat's mite Otodectes cynotis. The contrast covers amplitude variation in the 1-3nm range. Size of the whole image equals 4.6microns. Nadejda Borisovna Matsko, Institut für angewandte Physik, ETH Zürich. Bottom image: Morphology of a blend of two SBS block copolymers with different chain-architecture. AFM tapping mode, phase image, image size = 3x3μm. Rameshwar Adhikari, Institut für Werkstoffwissenschaft, Martin-Luther-Universität, Halle-Wittenberg. To view additional images, please visit the Gallery. P.H. Vallotton, M.M. Denn, B.A. Wood and M.B. 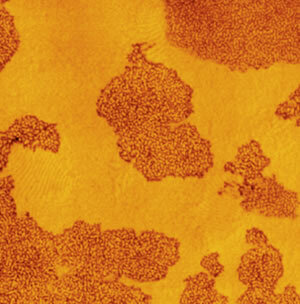 Salmeron: Comparison of medical-grade ultrahigh molecular weight polyethylene microstructure by AFM and TEM. Diamond Knives can be ordered online using a credit card or purchase order number for payment. Click to order an AFM Diamond Knife. Diamond Knives can be ordered by phone at 215-412-8390 or fax 215-412-8450.